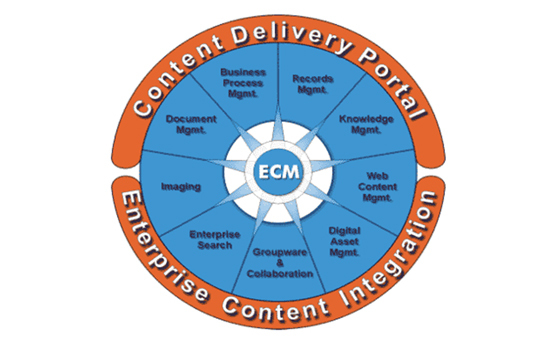 The Enterprise Content Management & Portals (ECMP) Team at INJ Software Solutions is focused on providing solutions where content drives the business process across the enterprise. Enterprise Content Management & Portal practice is one of the technology centers at INJ Software Solutions, focusing on delivering business solutions across the verticals by applying strong domain experience and focused technology research in the area of Enterprise Content Management. Collectively these offerings are used to build true Enterprise Content Management solutions using industry standard platforms like Documentum, FileNet, OpenText, Hummingbird and IBM Content Management addressing Banking, Insurance, Manufacturing, Life Sciences, Publishing and other verticals. ECMP group has setup four dedicated practices for IBM ECM, FileNet, Documentum and OpenText & HummingBird. With lots of experience in deploying solutions based on these ECM platforms, ECMP is geared to provide solutions for all industries worldwide. Documentum 4i, Documentum 5.x, Documentum 6.x, Content Server, DFC, WDK, Web Publisher, Business Process Services (BPS), WebTop, Application Builder, Developer Studio, Business Objects Framework, Digital Asset Management, Content Intelligence services, Documentum Portlets, Web Development Kit, Records Manager, Learning Services, Form Builder, eRoom. IBM CM and Lotus Domino Practice has extensive expertise on IBM Technology including IBM Web Sphere Portal Server, IBM MQ Integrator, MQWF, IBM CM, MQ Series, Lotus Notes Domino IDE, Domino.Doc, Lotus SameTime, QuickPlace, Discovery Server, Lotus Extended Search, Lotus Learning Management System (LMS), Domino Workflow and other products of IBM. Livelink Enterprise Suite (Document Management, Collaboration, Knowledge Management, Web Content Management, Business Process Automation, Enterprise Portal, Records Management) Digital Asset Management, Email Management & Livelink for SAP, Siebel & Peoplesoft.